This month, we get away from the stress of Bangkok to seek refuge in the scenic mountains of Khao Yai about 200 km to the north-east of Bangkok. 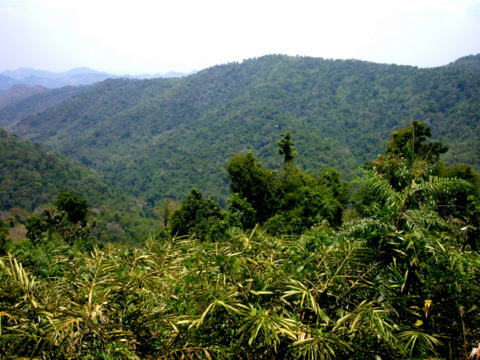 The Dong Phayayen – Khao Yai Forest Complex is a vast forest complex covering the provinces of Saraburi, Nakhon Nayok, Nakhon Ratchasima, Prachinburi, Sakaeow and Buriram. It covers a distance of 230 km from Ta Phraya National Park on the Cambodian border to the east to Khao Yai National Park to the west. The forest complex is home to about 800 fauna species, including 112 mammal species, 392 bird species, 200 reptile and amphibian species. It’s an important conservation area for endangered species to ensure their long-term survival. On 14 July 2005 this forest complex became one of the natural sites added to UNESCO’s World Heritage List together with the Norwegian fjords. 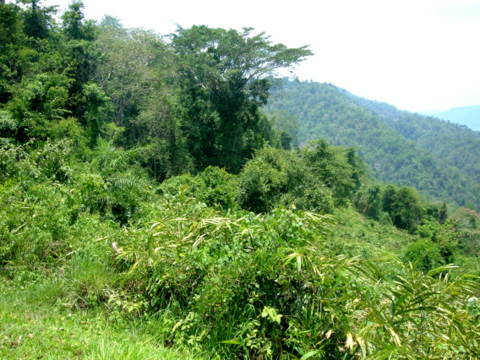 The other natural site in Thailand in the UNESCO’s World Heritage List is Thungyai-Huai Kha Khaeng Wildlife Sanctuaries. This site which was added earlier in 1991 stretches over Kanchanaburi, Tak and Uthai Thani in north-western Thailand. On 29 April 2010, it was reported that a seven-year old tigress gave birth to four tiger cubs in the Huai Kha Khaeng Wildlife Sanctuary in Uthai Thani. This is the largest litter of tiger cubs delivered in this country and it’s a fitting way to commemorate the Year of the Tiger. 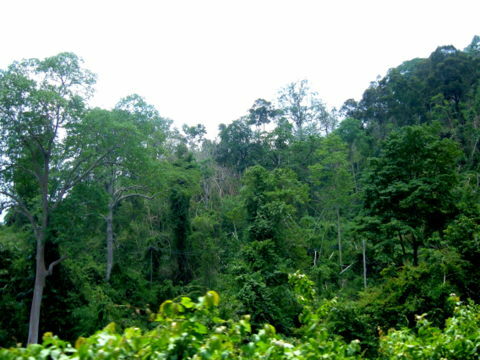 The Khao Yai National Park, a two hour and a half hour drive from Bangkok, is part of the Dong Phayayen – Khao Yai Forest Complex. Khao Yai is the first national park in Thailand and was designated on September 18, 1962. The park covers an area of 2,168 square kilometres over four provinces, Nakhon Ratchasima, Nakhon Nayok, Saraburi, and Prachin Buri. In 1982, the park was also listed an ASEAN Heritage site. 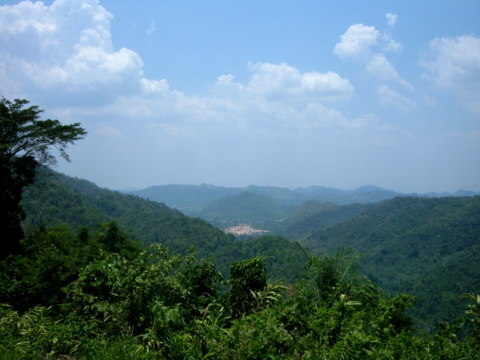 Khao Yai is part the Dongrak Range, a mountain range that starts from the south of Surin on the Thai Cambodian border. The range forms a barrier between Thailand to the north and Cambodia to the south. It continues westwards as it winds its way from the Cambodia border past Sa Kaeo and onto Saraburi in central Thailand. The Dongrak and the Phang Hoei Range that runs from northern to central Thailand, separate the Korat Plateau from the rest of central Thailand. These mountain ranges are covered by tropical evergreen forests and wide grasslands. 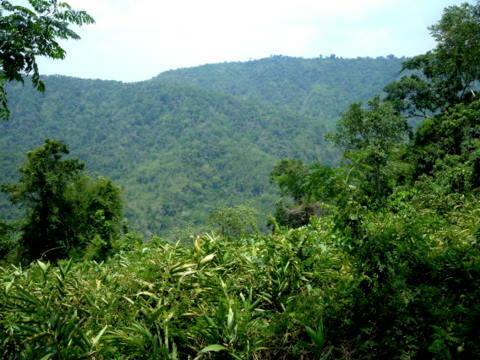 The highest mountain is Khao Rom at 1,351 m. Five rivers drain the area which has abundant wild life. 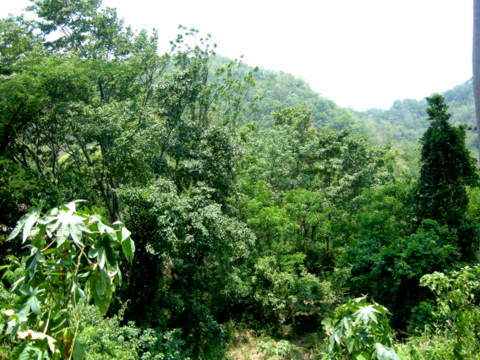 The area is home to wild elephants, monkeys, deer, porcupines, butterflies, insects, bats and a large variety of birds. We didn’t get a chance to meet any of these residents of the park even though there were notices along the way reminding motorists to be careful of animals crossing the road. The road to the Khao Yai National Park has several beautifully designed restaurants, cafes, souvenirs shops and steak houses. The area is also famous for its dairy farms, vineyards, wineries, resorts and golf courses. But it was this cluster of buildings that caught my eye. They stood out because there were most un-Thai. 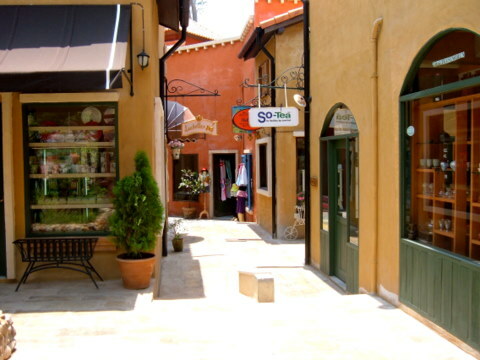 These cafes, restaurants, souvenirs and flower shops are reminiscent of some small Italian village. This place is called Palio, after “Il Palio” the horse race that’s held twice a year among 10 of the 17 Contrade (districts) in the medieval city of Siena, Italy. 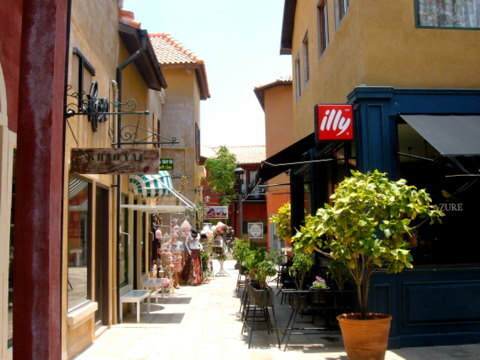 The owners of Palio, who just love Tuscany in Italy, decided to add the Tuscan charm of Florence and Siena to Khao Yai. 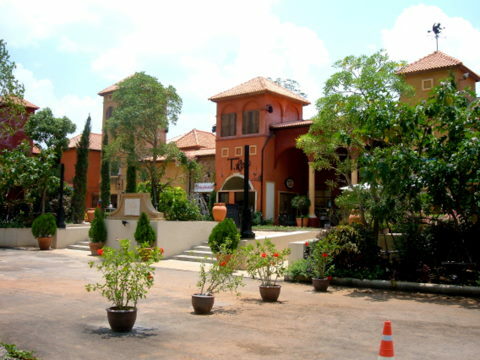 They have a similar development in another part of Khao Yai called Primo Posto but we didn’t have the time to go there. 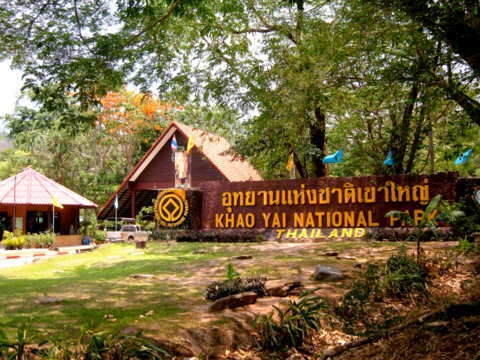 However it is the sheer natural beauty of the national park that’s the main attraction of Khao Yai. After paying the entrance fee of 40 baht per head and 50 baht for the car, we drove along a winding mountain road with lush greenery on either side. The steep foliage covered slopes on one side of the road drops sharply on the other side to the jungle below. At this viewing point near the top, we had a breadth taking view of the surrounding area. Here’s a shot at the viewing point where the road levels off before it goes up to the next level. Besides sightseeing, other activities in the park include camping at designated camp sites and hiking through the jungle trails. Unfortunately the car was having problems and we didn’t want to risk going further on to the three waterfalls ahead, which was a real disappointment. I’m sorry I was unable to bring you everything that I intended to. However these scenes made the trip worthwhile. They were such a pleasant relief from the current tensions in some parts of Bangkok. 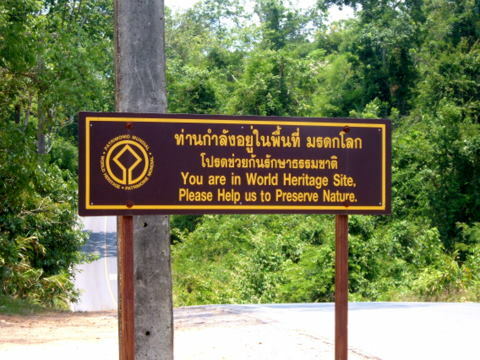 Please click on this link for the map to Khao Yai National Park. There are two ways of getting there by car. 1. Take the northbound Phahon Yothin Road to Saraburi. From there turn right into Mitraphap Road – Highway 2. Take the road that goes to Nakhon Ratchasima. 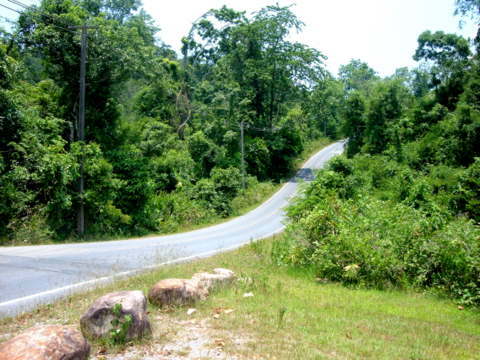 Continue on to the Pak Chong junction and take the right fork marked “Khao Yai”. This road is named Thanarat Road on the map. Proceed on till you get to the national park. This was the route we took.